Flowers serve as an inspiration and a tribute to friends and loved ones during trying times. Cremation urn and memorial flowers can act as a personal expression of love or as a warm send-off. When you work with Artistic Florist, we endeavor to illustrate the essence and memory of your loved ones with a beautiful floral expression of their lives. Our selection of floral inspiration covers a wide variety of personalities and tastes. Looking for something different, or want to add a personal touch? We also do custom arrangements. Call for pricing. Add on a food item to go home with the family after the service! $19.95 is the 2.3 pound size, 22.95 is 30 oz. 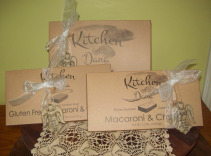 of Gluten Free Pasta and the large size is 29.95 of frozen gourmet Mac and Cheese.Locally made in Cleveland, Ga. Each food item comes with a ribbon and keepsake angel. *Food items must be order along with a floral order.